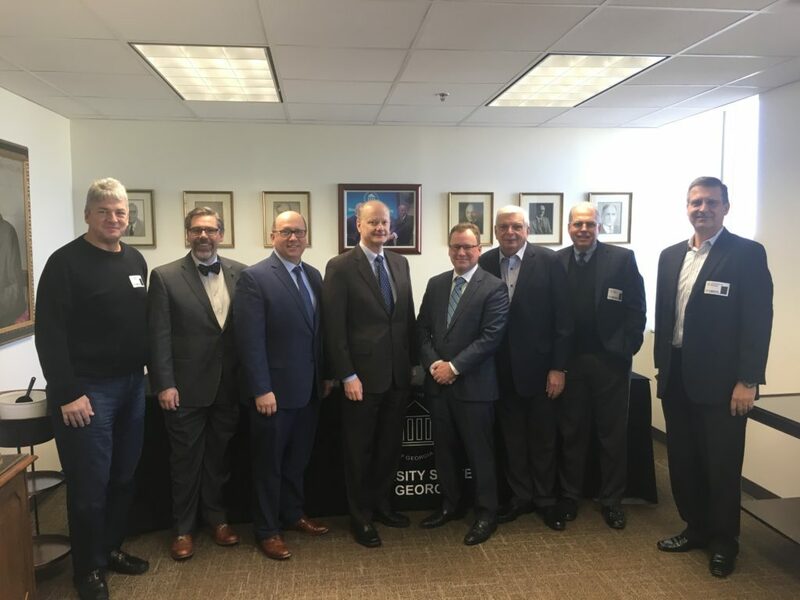 A strong delegation of ATPC board members, member company delegates, and staff joined Executive Director H. West Richards at the University System of Georgia (USG) offices in downtown Atlanta on February 8th for a meeting with Chancellor Steve Wrigley. The meeting, the ATPC’s first with the USG chancellor was a chance to garner support for the FinTech curriculum, and FinTech Academy initiatives that the ATPC led for the last three-plus years. The ATPC realized a FinTech curriculum was necessary in early 2015, when its member companies expressed their concerns about a trickling talent pipeline of USG graduates, the expense of importing talent, and unsustainable “poaching” of employees from each other. The ATPC began a collaborative process with the USG to perform a FinTech ecosystem needs assessment, which grew into the FinTech Academy concept after an introduction to Art Recesso, USG’s Chief Innovation Officer. The FinTech Academy is a first-of-its-kind undertaking that will differentiate Georgia from other states, and the world. The vision is for the academy to be both a physical and virtual presence – with the ability to reach every corner of the state. The joint ATPC/USG team is finalizing a report on the concept and a framework of competencies and capabilities, which they handed over to the chancellor on February 16th for review. In mid-February, the USG announced the “Nexus” degree, which was approved at their board meeting. The nexus degree will emphasize the connections between industry, skilled knowledge and hands-on experience in high-demand career fields such as cybersecurity and financial technology. This new, short-term college credential expands on an educational portfolio that already includes associate, bachelor’s, master’s and doctoral degrees. ATPC’s work advocating for the Fintech Curriculum initiative was a major inspiration for this educational milestone. You can read more from the Atlanta Journal-Constitution, Atlanta’s NPR-affiliate WABE-FM, and stay tuned to the ATPC website, its Twitter account (@TransactAlley), and future communications for news about the initiative.